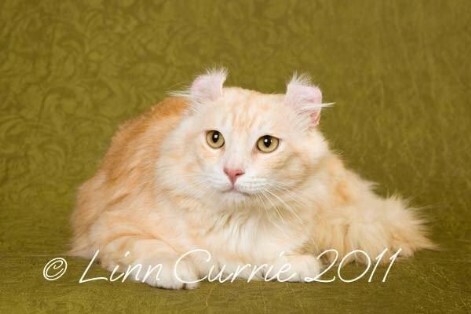 American Curls are born with straight ears. After the first few days, sometimes too slightly over a week the ears slowly begin to curl backwards. After four months the ears stop curling and will remain in that state for life. Before that the ears continue to curl and uncurl constantly. The ears are hard and stiff to the touch, very similar to a human's ear. The firm cartilage occurs from the base of the ear to at least one third of the ear, but often up to two thirds of the height of the ear. The balance of the ear must be flexible. 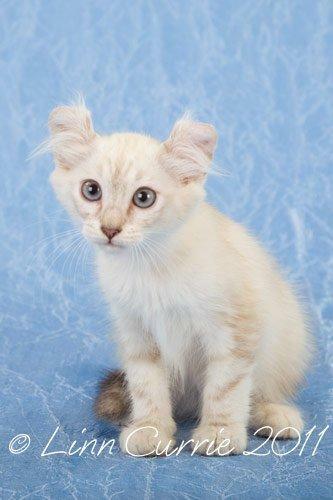 Pet quality kittens have almost straight ears. However to show, kittens should have a curl between 90 and 180 degrees. The greater the angle the better, but if the curls touch the skull this is a disqualifying fault. The degree of curl to the ear is the most important factor in defining show quality. Third degree ears have a smooth graceful curl without any abrupt changes of direction. Imaginary lines starting from the rounded tips of the ears follow to the point at the centre of the base of the skull. Ear furnishings accentuate and further enhance the curled ear. The degree of the curl is almost impossible to dictate by looking at the parents. A parent with third degree ears can very easily produce a first degree curl, whilst two first degree curled parents can just as easily produce a litter of stunning third degree curls. In the show ring certain faults are to be avoided with regards to the ears. Keep in mind that this is purely for aesthetics and in no way causes the cat any harm or discomfort. 1. Vertical crimp: Begins at the base of the ears and continues along some or all of the height of the ear. The outer edge of the ear bends vertically towards the centre of the ear. This gives the outer edge of the ear a pinched or crimped effect. A vertical crimp often appears to straighten the ear. Note: first and second degree curls are not necessarily caused by this fault. They may simply have a natural looser curl. 2. Horizontal crimp: Ears with excessive width at the base of the ears. The ear continues beyond the vertical curved ridge giving an exaggerated splayed appearance. A horizontal ridge of cartilage is also visible in the centre of the ear above the canal. 3. Narrow base of the ear. 4. Abrupt change of direction. The curl of the ear is ideally a smooth natural curve. 5. Thick or calcified ears. 6. 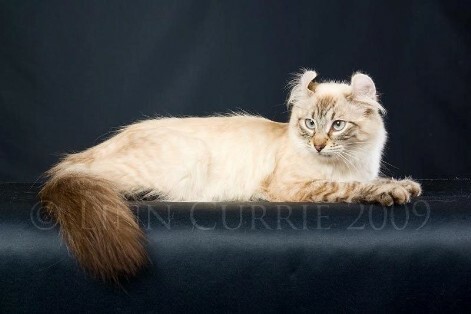 Extreme curl in an adult where the tip of the ear touches the back of the ear or head. The head is a modified wedge with no flat planes. Slightly longer than wide and medium in size, being in proportion to the body. The nose is straight, moderate in length with a slight rise from the bottom of the eyes to the forehead. A gentle curve to the top of the head without a pronounced break in profile. Ears are moderately large, wide and the base and open. Eyes are also moderately large, walnut shaped and oval on the top, round at the bottom. The body is medium in size and moderately long. The length of the body is one and a half times the height at the shoulder. Males are fairly muscular. Females are smaller. The tail is equal to the body length, flexible and wide at the base, tapering. The coat can be medium or short in length. Soft and silky in texture. Close lying and without a plush dense feel. Minimal undercoat. All coat colours and eye colours are accepted.